Yipee! It’s spring, and we’ve already been working in our garden. So to celebrate, I created a spring garden tablescape filled with the colors and signs of spring. I started with this new spring green tablecloth that is the color of new growth on trees and shrubs outside. You know, that color we’ve been dreaming about seeing all winter long! The centerpiece is a little wheelbarrow that I’ve had for several years. I loaded it up with some vintage gardening tools, new gloves, and some recently planted flowers. 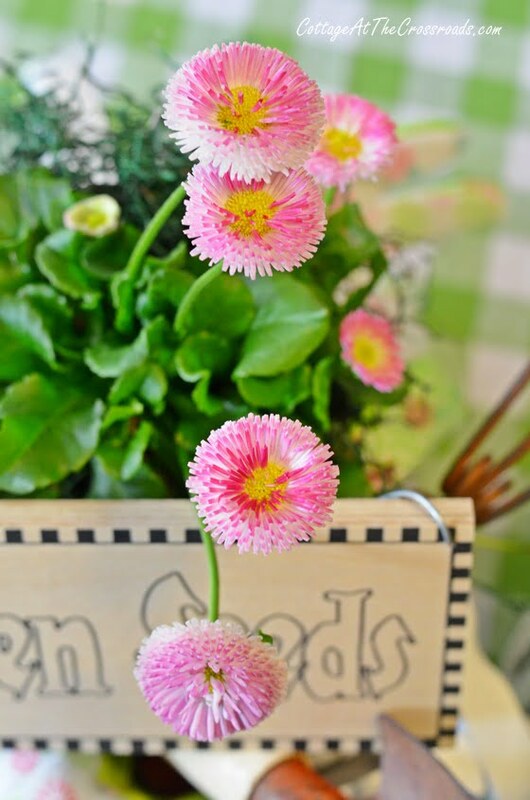 The flowers are little pink English daisies that you can find at garden centers right now. 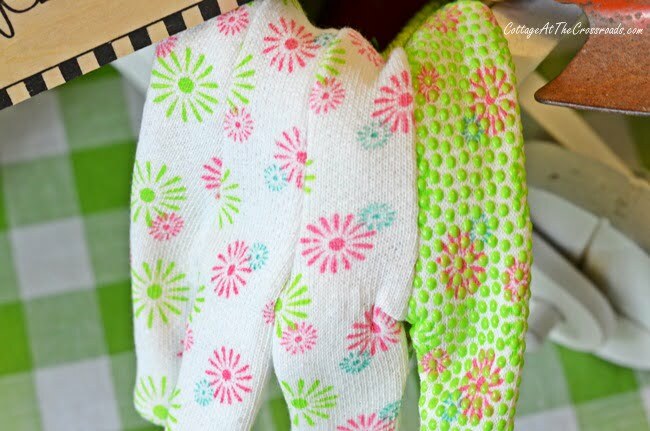 I didn’t notice this until later, but the flower design on the gloves mimics the daisies! The Garden Seeds sign I picked up months ago from a bargain store. 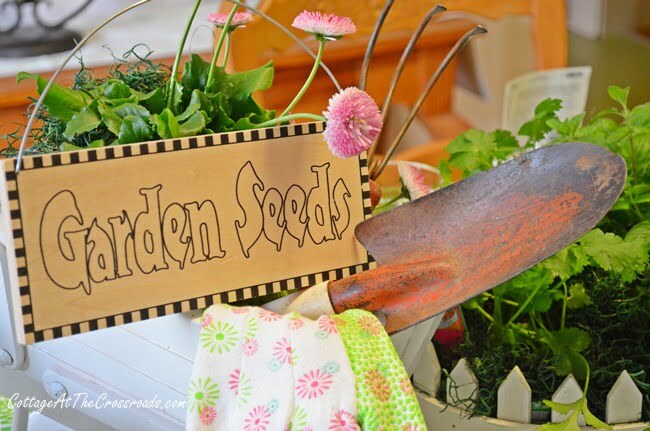 I tucked it into the wheelbarrow because I decided that if you are going to have a garden party, you need seeds! 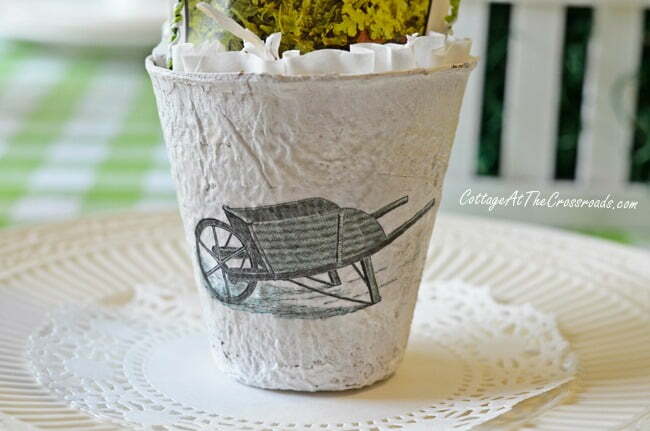 So I created some more decorated peat pot baskets and used a wheelbarrow image that I found on the Graphics Fairy. The baskets are holding seed packets as favors for the guests to get some things growing, too. I have just fallen in love with these little baskets that you can create very inexpensively with peat pots. If you’d like to see the ones I made with bunnies on them, click over to my post A Neutral Bunny Tablescape. 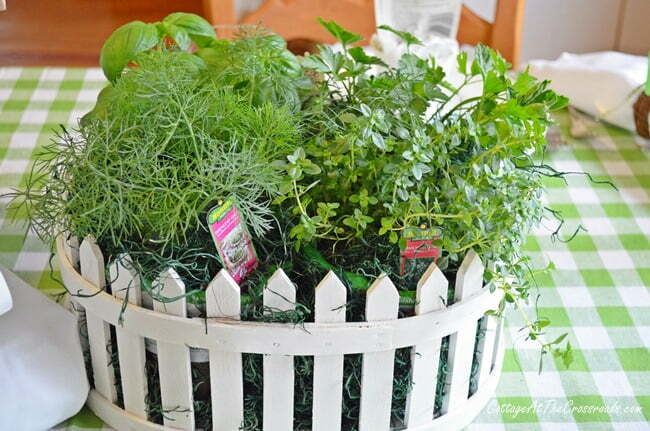 Along with the wheelbarrow, I used two of these picket fence planters and filled them with herbs. I found the planters last year at the auction on two different days. Luckily, they are exactly the same. The herbs will be going into our garden as soon as this last blast of cool weather passes on. My sweet sister-in-law Jean picked up these green glasses last week when she spotted them at Carolina Pottery. She loves the color green as much as I do! For napkin rings, I used some tiny grapevine wreaths and attached these little chalkboards that I found recently at Hobby Lobby. They just happened to be the right color of green! I’ve just started decorating the cupboard in the dining room, but you can see that it’s going to have a green and white theme. The same goes for the corner cabinet where this new bunny has landed. Have you noticed that I painted the back of the corner cabinet and the cupboard green? I did that before Christmas, and I’m so glad I did. Items placed against it really pop, don’t ya think? I had to bring my large bunny planters inside to protect them from the expected freeze that we’re going to have tonight. One of the hazards of planting spring flowers too soon! Nonetheless, I’m so happy to be decorating for spring, aren’t you? This spring inspiration is whimsical , beautiful and wonderful! What a darling table. I just love all the details and your theme. 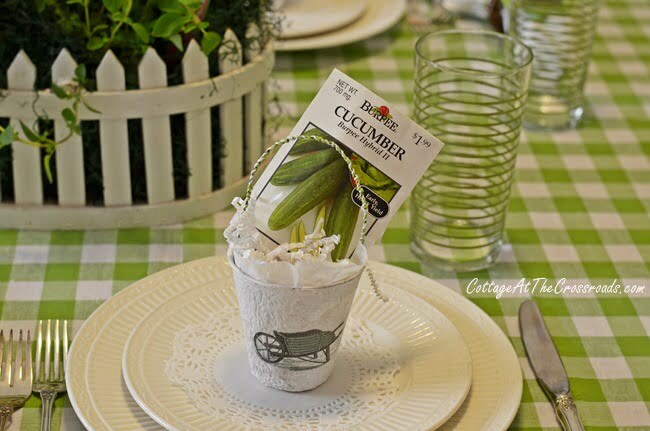 I especially like the little peat baskets and how fun and easy…just charming. It’s nice to see something so springy right now. Oh this just speaks “spring”! I have a similar wheelbarrow, you have inspired me. Jane- Your spring garden tablescape is absolutely stunning. We are all ready for spring, right? Thank you for joining our second Thoughts of Home on Thursday party! You have me dreaming of spring with that beautiful table scape. Jane, I remember this tablescape and I’m so glad you linked it with TOHOT this morning. Everything on the table is perfect for spring. I’m going to make those peat pots this year! Hi Jane, I love your spring tablescape! 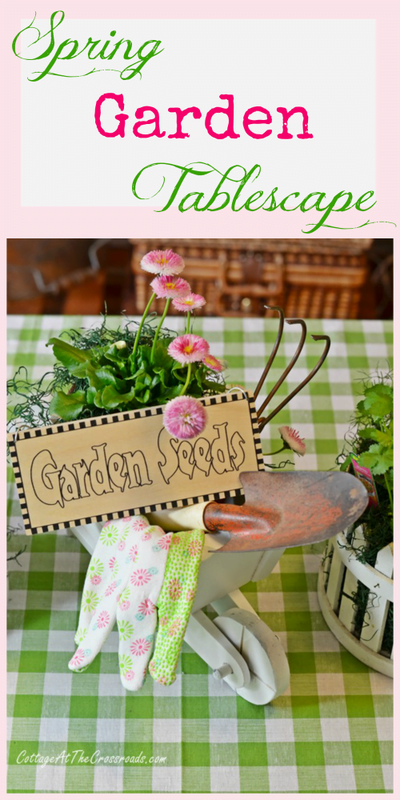 I am decorating a table for our Spring Fling at church and your tablescape is wonderful. I have been looking for ideas all over the place and your table is the cutest that I have seen. Thank you for sharing. I now have a better idea of what I should be doing! Easter at our house will be more fun this year, too! I want the table cloth! Everything is stunning! 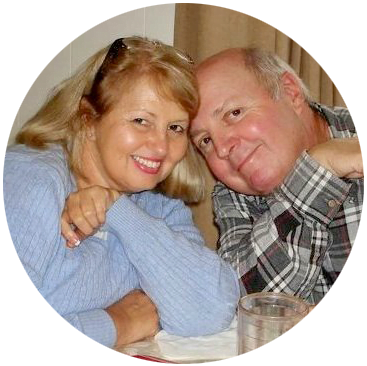 I’m so glad I found your blog today–I really needed a lift from the winter blues! Gosh, Jane, I don’t know where to start.. It all looks so pretty. Love the sign with sunflower that you all made using the dremel..That’s another power tool my DH has and doesn’t use anymore. I think I had better pull those insturction booklets out and see if I can figure out how to use it. Guess it’s almost like a woodburning tool? I don’t think he used it for that purpose but for the life of me can’t remember what he used it for. Guess I’ll have to ask him! Was going to ask you how you made the sign Garden Seeds but you busted my bubble telling us you bought it somewhere. Gosh, I’ve got a lot of things to learn about..Guess I’ll be busy this winter learning how..(famous last words!) I think I’d better make a list of winter projects I’d like to try.. I am behind in checking everyones posts. I love this tablescape-the green and white looks so fresh. I am so ready for spring and happier days. Adorable table, Jane! 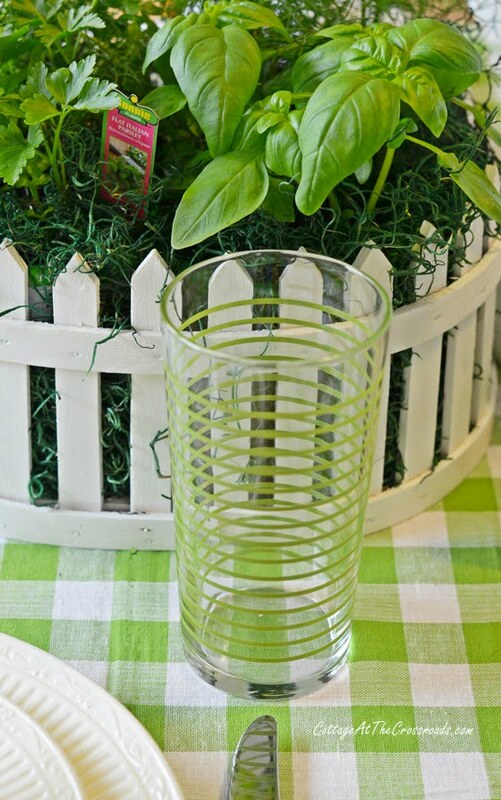 I love the picket fence planters, I have a few rectangular ones, and lots of little rounds that are for votives. The green and white check just pops! 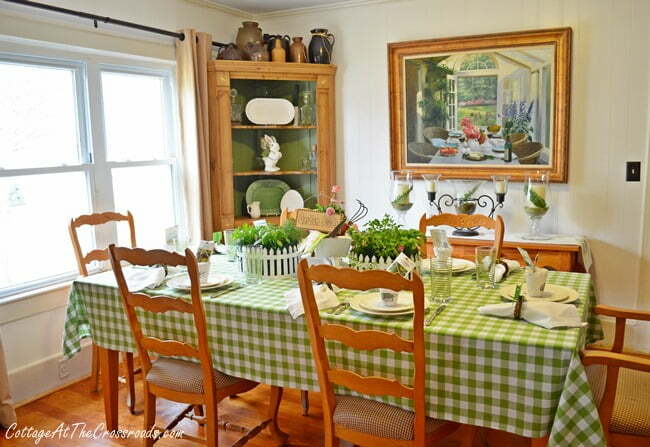 Your garden tablescape is so adorable…I love your cupboard!!!! Your table is absolutely beautiful! I have been reading your blog for a couple of years I think, but have never commented. I get so excited each time I see that you or Leo have a new post up. You are so creative and I just love everything you do. The cloth on your table is lovely! I do not have a blog. 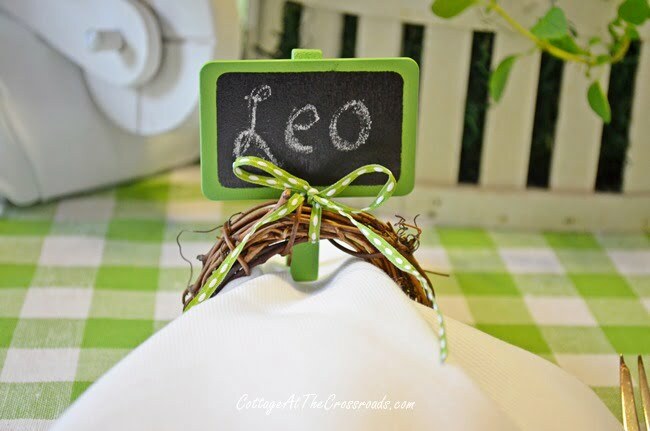 Beautiful and clever…love all of the greenery and garden images. Your table is so cute!! I love love love the peat pots. 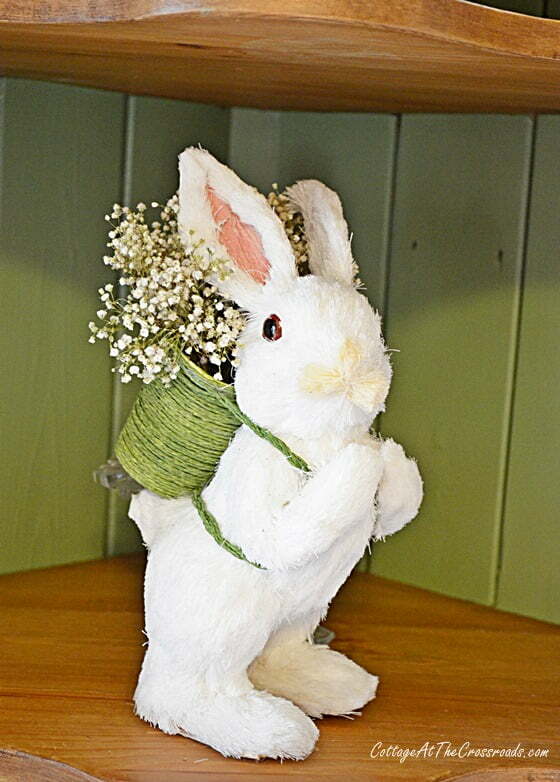 I did some Easter Baskets last year from peat pots- and was looking for a new way to use them – your idea is adorable!! 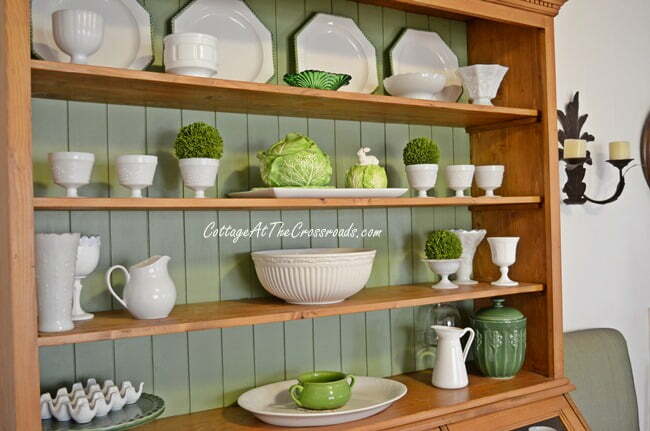 The green and white in your cupboard looks great! Such a sweet tablescape. 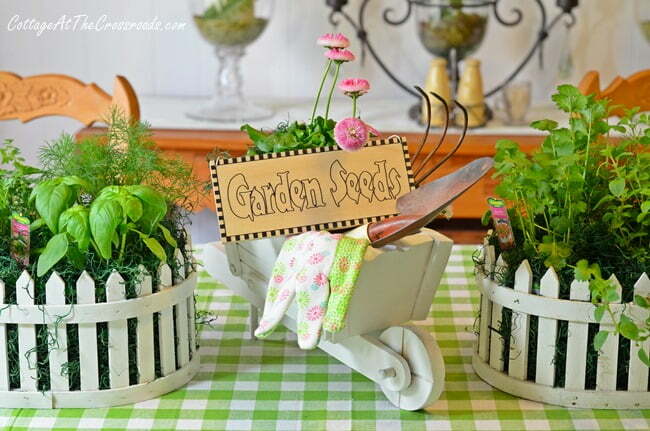 I love the little daisy’s and that wheel barrow! This table is beautiful!! I did a garden theme several weeks ago but I like yours better!! Jane this is gorgeous and I LOVE the pots and this is such a gorgeous theme. Love what you did for the center of the table and your bunnies. This is such freshness for spring. PINNING!!! 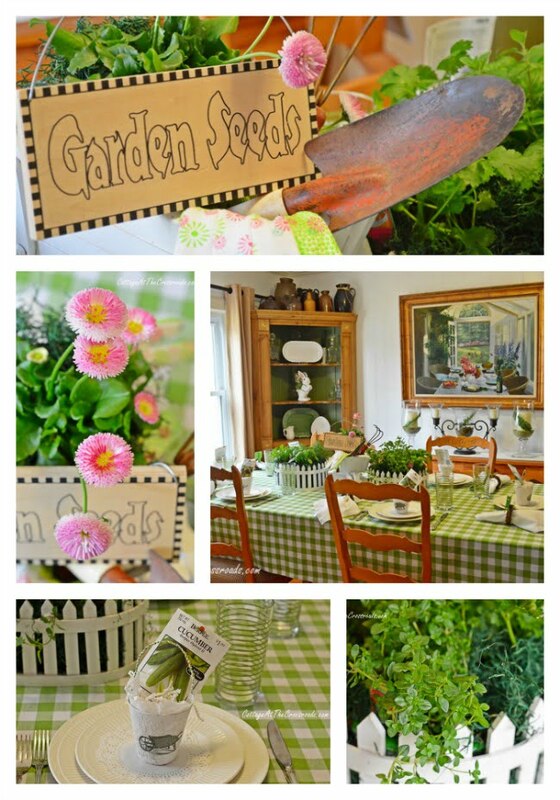 The Spring Tablescape is just the perfect one for you and your home…love the garden theme and speaking of garden, I so look forward to your beautiful garden this year!…and so love the cupboard in the dining room…Love the colors! Your spring decorating is beautiful! I love the peat pots. How did you get handles on them? Green is a great color & I am a gardener too. Hi Monah, nice to meet another gardener! :) I made the handles by twisting twine onto floral wire and hot gluing the ends down inside the peat pots. Whatever you place down into the peat pot will hide where you hot glued them. I placed a coffee filter down inside these, but you could use Easter grass, potting soil in a baggie, crepe paper, etc. in the pots. I really like your garden Tablescape! 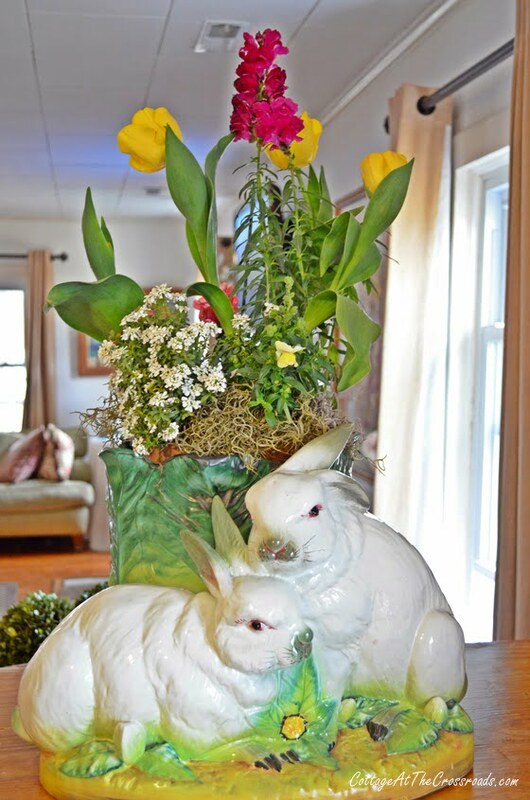 You have inspired me to move my white china to my big hutch and get out all my Easter decorations. It all looks great! Sharon, so nice to have inspired you! Most of our Easter decorations are still in the attic! Love the spring tablescape, and LOVE the bunny planter! What a lovely dining room. You did a fabulous job! really cute Jane, love the picket fences and your wheelbarrow! Oh that table did my heart good! It’s still so cold here, it was glorious to see that spring is blossoming somewhere. Oh Jane I just love it! I too, am happy to be decorating for spring! Love the corner cabinet with the back painted green, it does make everything pop! Gardening has begun here, I could not wait to get out there and get a few things done.Will have to cover some things tonight, but it was worth it to have flowers after this long winter. Enjoyed this post very much, You made me smile! Cute as usual, it’s still snowing here and getting down to a actual 20 degrees tonight. But like you I’m starting to decorate for spring. I’m having to shop because this is the first year I have felt like decorating since the fire (4 yrs.) Iv’e mostly been trying to get the new house to feel like home, but thanks to you and I do mean you the old fire to decorate is back. Thank You! Tonia, thanks for that beautiful comment! 🙂 I don’t know how you’re going to resist all those pretty decorations that you’re going to see when you go out shopping! I try to mix in a few new things with a lot of old, but I realize you’re having to start all over again. I just cannot imagine how devastating it would be to lose your home and possessions to a fire. Jane, You had me at gingham checks! The green and white looks so fresh on the gingham tablecloth. I am loving the little peat pots too. I am hoping to have some time this week to get some made up to use in a tablescape over the next week or two. I was going to ask if I could come down to eat, but I don’t see any place to sit down. But it sure is pretty. That’s a huge compliment, Woody! I didn’t think guys noticed those kind of things much! You know there is always a place for you to eat at the Crossroads! You have a great talent. It’s Beautiful ! Your table looks beautiful, Jane. It makes me very happy to see this as we are still looking at a lot of white outdoors yet. Your peat pots are sweet & I love that tablecloth! Very cute ! Love those little picket fence baskets ! Yes, I love it all! Spring and everything you have shown! Great Job! Jane, this is so cute. You know how I love checks.